Photo courtesy Canton Daily Ledger. William G. Barker built archtop guitars in the 1960s in Toledo, Ohio. In the early seventies Bill Barker and his brother Jack opened a shop at 6100 S. Adams Street in Bartonville, Illinois where they built and repaired guitars. Bill would build the majority of his guitars in Illinois and would pass his knowledge and expertise on to at least two aspiring luthiers who would continue his tradition – Bill Hollenbeck and Billy Cook. Bill Barker originally learned guitar building from Carl Albanus Johnson, a violin maker in Chicago who built 60-70 archtops of his own before passing away in the 1970s. Carl is believed to have learned to build archtop guitars from none other than Elmer Stromberg (See Albanus guitars on this website). Bill Barker produced 110-120 of these guitars. The Model 1100 adjustable Rhythm Chief in gold was fitted in these archtops with a short fixing bracket and one black volume control knob mounted in the pickguard. 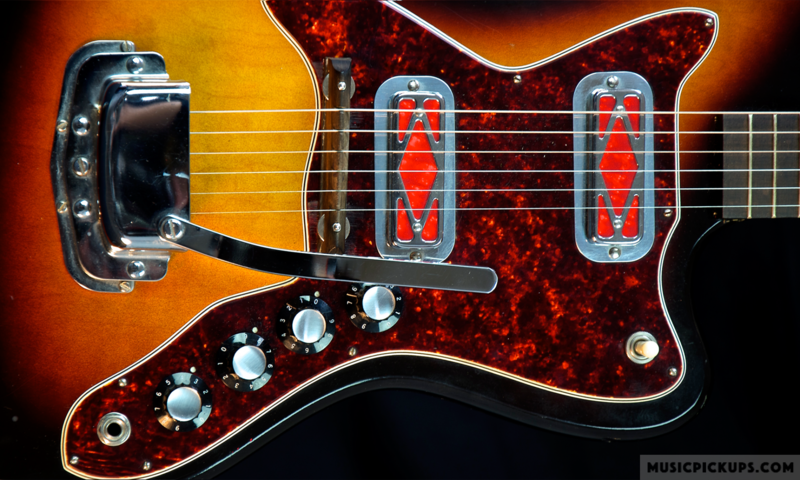 A rebate was cut into the upper edge of the pickguard to allow the pickup to slidE some way along its pressure rod thus enabling a change in tone (photos copyright Guitars ‘n’ Jazz of Summit, NJ., USA).